Like all good parents, mine made me eat my vegetables growing up. I don’t remember struggling too much with this rule, except when it came to the most dreaded vegetable of all–the pea. Those tiny green dots gave me fits, and I made sure my parents knew exactly how much they were torturing me with each and every bite. In full dramatics, I would plug my nose and screw up my face, barely mustering a swallow before I came back for air, gasping and begging for mercy. I’m sure today my parents are laughing triumphantly, because here is their afflicted daughter, writing a food blog, and dedicating an entire recipe to the despised green pea. I can only say I’m sorry, mom and dad. I’ve had a change of heart. It turns out that peas are actually pretty delightful after all. My change of heart started at G. Michael’s, where I celebrated my birthday last year. I must’ve been feeling particularly adventurous, because for some reason I ordered the pea soup. The bowl placed before me looked quite lovely, although not quite like food. It was a vibrant green, with none of the yellowed hue I seemed to remember from my childhood. After my first bite, I was surprised first off to discover the soup was served cold, and secondly to realize I actually loved it. Since that night, I’ve had pea soup on the brain. I’ve waited nearly a year for spring to roll around again and give me an excuse to make it. When it came to recreating the recipe, I knew I wanted something with minimal ingredients, allowing the bright sweetness of the peas to be the star. I found a recipe at The New York Times entitled Possibly The Best Pea Soup and decided that would be a good place to start. When it comes to simplicity, this recipe rules the day. With nothing but shallots, garlic, water, peas, and a bit of basil, this soup is light, silky, and the essence of spring. A little cream stirred in at the end gives it just a touch of richness. I used frozen peas, because fresh aren’t readily available in our area just yet, and also because I’m lazy and opening up a bag of frozen peas is about as easy as it gets. 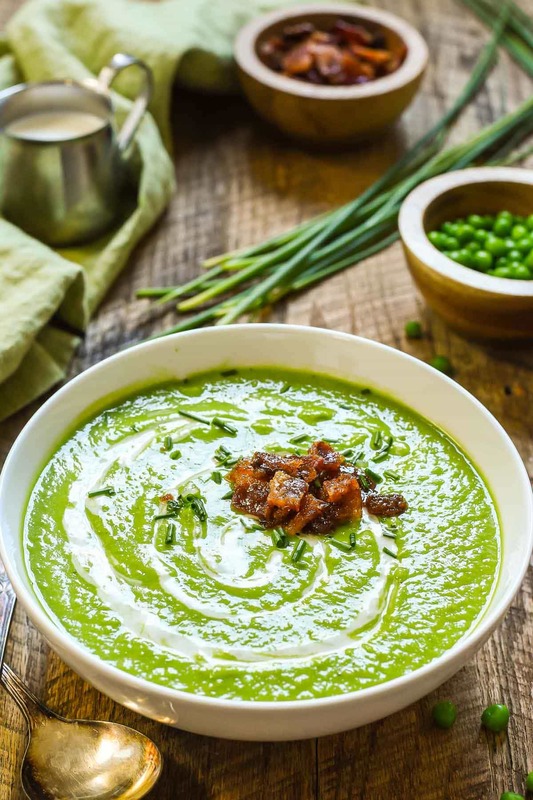 On it’s own this pea soup is delightful, but what truly puts it over the top is a crumble of candied bacon, which melts into the soup, giving it a hint of maple and just the right amount of savory crunch. I’ve included the recipe for a whole pound of candied bacon. You likely won’t need all of that for the soup, but I trust you’ll have no issues polishing off the leftovers (stacking it on this Strawberry Bacon Goat Cheese Grilled Cheese seems like a very viable option). Just like the soup that started it all, this one can be served hot or cold, though I prefer it hot. I ate it for lunch three days in a row. It pairs beautifully with a grilled cheese or a slice of buttered homemade Amish White Bread. 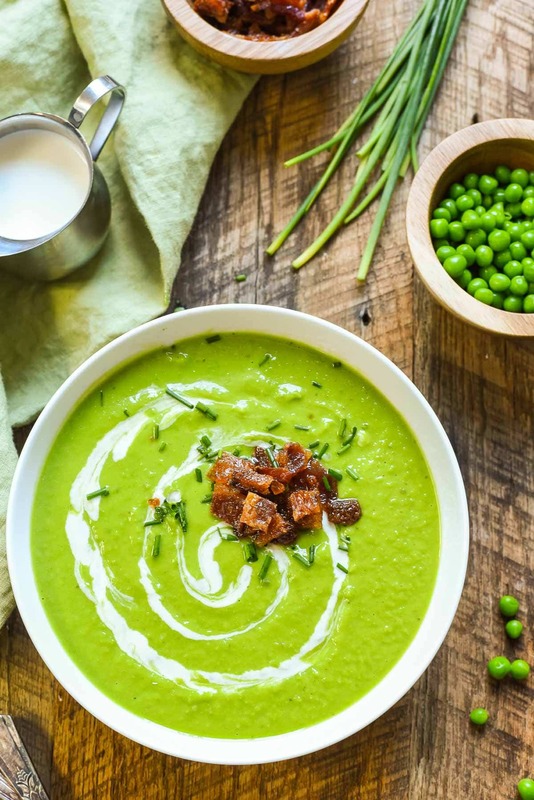 While pea soup can certainly make for a week’s worth of delightful lunches, it’s also a lovely appetizer to serve before your Easter dinner. If you’re serving this up for a special occasion, swirling the cream on top and giving it a sprinkle of chives makes it look absolutely beautiful. So beautiful that you might even be able to convince the pea-haters in your life to give it a try. 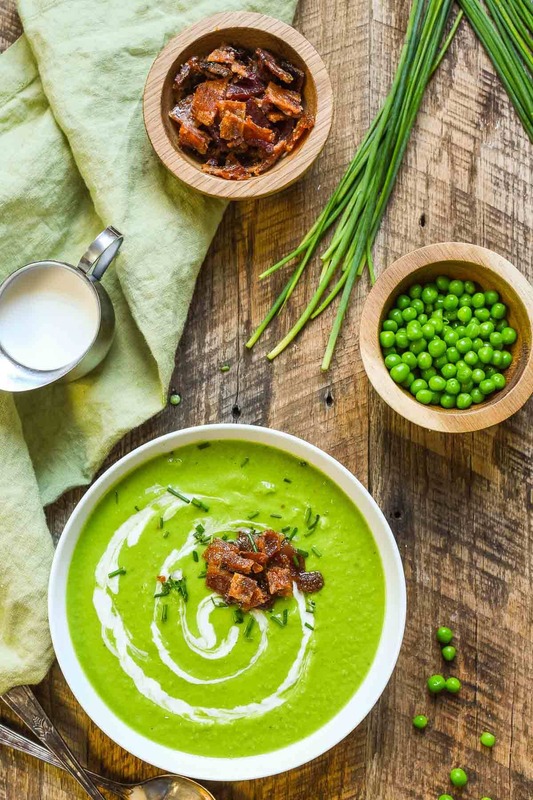 Frozen green peas, garlic, shallots, and basil come together to make a fresh and creamy spring soup. The candied bacon adds just the right amount of indulgent sweetness. Preheat the oven to 400 degrees. Line two baking sheets with foil then top with wire racks. Place the bacon slices on the racks. Brush half the maple syrup and brown sugar on the top. Place in the oven and bake for 15 minutes. Pull the bacon out of the oven and flip. Brush with remaining syrup and brown sugar. Bake for another 15-20 minutes or until bacon is crispy. Store any leftovers in an airtight container in the fridge. In a large soup pot, heat the oil over medium heat. Add the shallots and stir until starting to soften. Stir in the garlic and cook until fragrant. Add the water and bring to a boil. Reduce heat to medium low and simmer for 20 minutes. Stir in the frozen peas, basil, salt, and pepper and return to a boil. Boil for about five minutes, then remove from heat. Transfer the soup into the blender in batches and puree until very smooth. I prefer to cover the blender hole with a paper towel to allow steam to escape. If desired strain the soup through a fine mesh sieve to remove any shells or lumps. Stir in the cream and reheat to serve warm or serve at room temperature or chilled. Top with candied bacon and chives. I’ll bet your hubby skipped the soup and went straight for the candied bacon! Am I right? Looks like a really impressive soup Courtney. This soup is delicious! Took me longer than expected, but it was well worth the wait. So glad you enjoyed it! Thanks for coming back to let me know! This was amazing! I put two cubes of chicken bullion in the water- that’s the only change I made. It was really incredible though!